NOTE: We inform you that Leo Nucci has decided to eliminate the role of the Conte di Luna from his repertoire because this is no longer suitable for him at this stage of his career. The Management of the Theatre would like to thank Franco Vassallo who will perform the role of the Conte di Luna in the following performances: 15, 18, 22, 25/02, 4, 7/03. 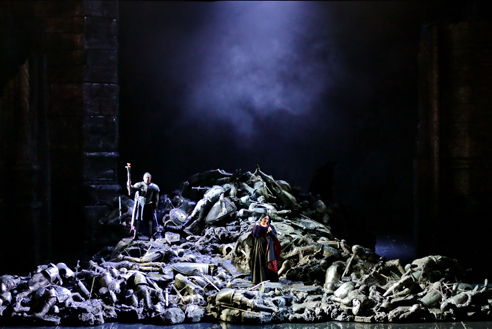 We also inform you that Massimo Cavalletti will not perform in the production of Il Trovatore; the role of the Conte di Luna on 20/02, and on 1 and 6/03 will be performed by Simone Piazzola. Entrance hall of the palace of Aliaferia. Ferrando, the captain of the guard under the Count di Luna, is waiting for his master. But the Count is delayed because he has fallen in love with a young lady and is closely watching her, due to his jealousy of a mysterious troubadour who has been serenading the girl (introduzione “All’erta, all’erta!”). Meanwhile those present beg Ferrando to tell them the story of the Count’s brother (“Di due figli vivea padre beato”), which he does. The old Count di Luna had two sons, but one morning the nurse had found a gypsy woman bending over the younger child’s cradle. The woman had been immediately chased away, but had evidently cast an evil spell on the child, whose health began to fail. The gypsy woman had therefore been pursued, caught and condemned to be burnt at the stake. To avenge her mother, the gypsy’s daughter had returned at once to the palace and abducted the infant. Later, the remains of a burnt child had been found in the ashes of the stake. The old Count had died a few days later, after making his elder son promise to continue the search for his brother.The clock strikes midnight. Leonora, lady-in-waiting to the Princess of Aragon, confides to Ines that she loves an unknown knight (scena and cavatina “Tacea la notte placida”), whom she had met during a tournament; then, one night, Leonora had heard him singing beneath her window, to the accompaniment of his lute, and pronouncing her name. Since then she has been unable to forget him and feels sure that their destinies are intertwined forever. The Count di Luna now enters and would like to declare his love lo Leonora, but he is disturbed by the sound of a lute, on which a troubadour is playing a serenade (scena and romanza “Deserto sulla terra”). 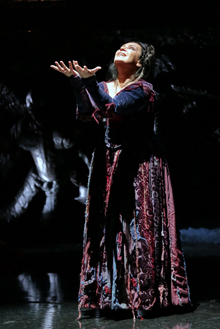 Leonora descends and is about to throw herself into the arms of the Count, whom she has mistaken for her beloved. But having realised her error, she tells the troubadour that she loves none other than him (trio “Qual voce!…Ah! dalle tenebre”). When the Count di Luna, in a rage, asks the young man to disclose his identity, he declares that his name is Manrico. The Count recognizes him as a follower of the rebel prince Urgel and challenges him to a duel. Despite Leonora’s pleading, the two men go off to fight. Towards dawn, a group of gypsies are working in their encampment (chorus “Vedi, le fosche notturne spoglie”). Next to the fire the gypsy Azucena breaks into song, drawing attention to herself. The fire reminds her of the flames of the stake at which her mother was burnt, and died invoking revenge (canzone “Stride la vampa!”). The gypsies go down into the valley and Azucena, left alone with her son Manrico, tells him the story related hitherto: that of his grandmother, who was burnt at the stake on the orders of the old Count di Luna (scena and story “Condotta ell’era in ceppi”). Azucena also recounts how she took her revenge by abducting one of the Count’s children, and threw him into the flames of her mother’s pyre. But later she realised that she had in her delirium killed not the Count’s child but her own son. Seeing Manrico’s astonishment, Azucena calms him, telling him that such grim memories can only drive her out of her mind. Then she gets her son – who had already met the Count in duel, but spared his life because of a mysterious celestial force felt within him – to promise that he will show no further mercy to the Count (scena and duet “Mal reggendo all’aspro assalto”). A messenger enters and summons Manrico to the defence of the recently captured Castellor fortress, and also informs him that Leonora is about to take vows in the belief that he is dead. Manrico, despite his mother’s alarm, sets out at once. The Count di Luna can’t resign himself to the loss of Leonora and is preparing to abduct her with his henchmen (scena and aria “Il balen del suo sorriso”). Preceded by a chorus of nuns (“Ah! se l’error t’ingombra”), Leonora, who is about to take the veil, enters. The Count di Luna steps forward to abduct her, but Manrico intervenes unexpectedly. 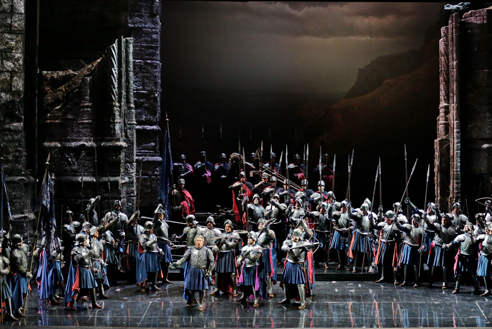 The general amazement (concertato “E deggio e posso crederlo?”) is broken by the arrival of Ruiz and of Urgel’s followers, who release Manrico and Leonora. The Count di Luna’s soldiers, encamped in sight of Castellor, are playing cards and singing (chorus “Or co’ dadi, ma fra poco”). Ferrando announces that they will storm the fortress tomorrow. The Count di Luna is determined to abduct Leonora from his hated enemy Manrico, but a tumult distracts him from his intentions. In a nearby field a gypsy woman has been caught and is now brought before him. She is Azucena, whom Ferrando recognizes as the gypsy who abducted the Count’s child long ago (scena and trio “Giorni poveri vivea”). And his conviction is borne out when he notices the woman’s fear on hearing the name of the Count di Luna, who has her arrested. When Azucena invokes the name of Manrico, the Count’s rage is redoubled. The bystanders call for the woman to be burnt at the stake. A hall of the palace. Manrico informs Leonora that a battle will be fought tomorrow and gives orders to Ruiz to supervise their defence. 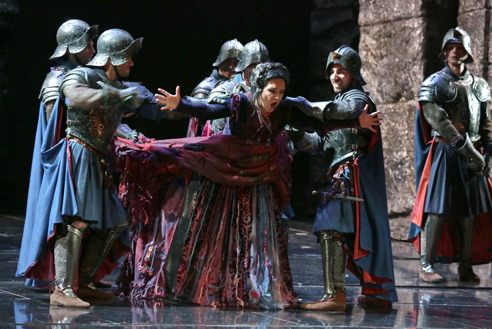 The two lovers, to the sound of an organ, are about to start their marriage ceremony (scena and cantabile “Ah sì, ben mio”), when Ruiz bursts in and, taking Manrico to the window, points to the pyre on which Azucena is about to be burnt. Manrico, in a fury (cabaletta “Di quella pira”), leaves his bride and rushes to his mother’s aid. 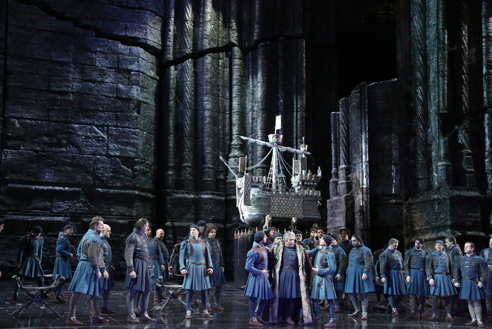 Leonora is led by Ruiz to the place where Manrico is imprisoned. Glancing at the ring on her right hand and thinking of her beloved (scena and cantabile “D’amor sull’ali rosee”), she hears the song of the Miserere and the voice of Manrico, who is about to die and begs her not to forget him. Leonora declares that her destiny will forever be linked to his (cabaletla “Tu vedrai che amore in terra”). 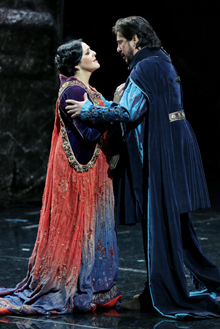 When she sees the Count coming out of a door and giving orders for the execution, she goes up to him and promises him her body in exchange for Manrico’s life (scena and duet “Qual voce!. .. come!… tu donna?”). Leonora secretly drinks the poison from her ring. Manrico is seated beside his mother, who is lying on a mattress (finale ultimo “Madre… non dormi?”). In her delirium, the gypsy pictures again in her mind the burning of her mother. But her son calms her, and lulls her to sleep with memories of their home in the peaceful mountains (“Ai nostri monti… ritorneremo!”). 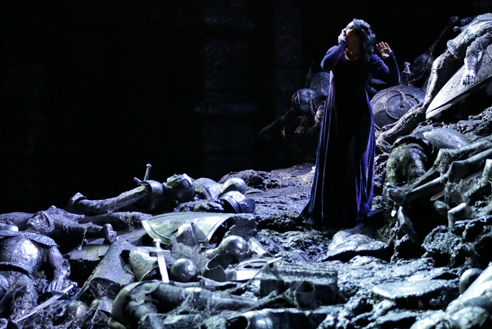 Leonora appears and urges Manrico to escape, though she cannot herself follow him. When he hears the price she has paid for his freedom, he curses Leonora (concertato “Parlar non vuoi!… Balen tremendo!”), but repents on learning that she has poisoned herself in order never to belong to anyone else. She dies in his arms. The Count gives orders for Manrico to be executed. Only then does he learn from Azucena, with horror, that he has murdered his own brother. The gypsy woman has at last avenged her mother. 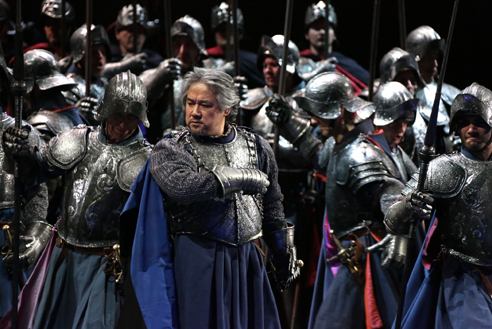 This entry was posted in OPera and tagged Daniele Rustioni, Franco Vassallo, Il trovatore, La Scala, Milano, Salvatore Cammarano. Bookmark the permalink.